Oh, you're just trying to tempt me. Of course I had to click on the ebay link, you knew I would; but I resisted! 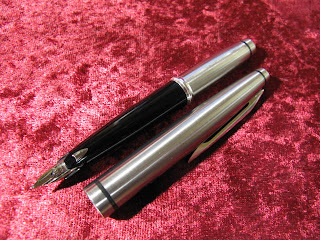 I'm actually eyeing the Lamy Safari All Star in raspberry with a fine nib. I will be dropping Christmas hints to Alexander but I've learned recently from an informed source that men don't take hints. Maybe I should order one for myself then let him know I've taken care of his Christmas shopping for him. Now that you've had your pocket pen for a while, what do you think of it? I have to admit that I was disappointed at first because the nib was more rigid than I expected and the ink flow was on the dry side. But with some use the ink has come to flow more readily and I really like it.